Zone Media Review 2019: Is Zone Media a Good Hosting? Zone Media is an Estonian web hosting and domain registration service that’s been in operation since 1999. They provide reasonably-priced hosting solutions that cater to the diverse needs of businesses and individuals. With over 30,000 virtual servers in Tallinn and Amsterdam, Zone Media is one of the few Estonian companies that have established themselves as a web hosting powerhouse. The services they offer include domain registration, shared and cloud hosting, security solutions, and internet services among others. While their clients are mostly businesses, they also cater to individuals who need hosting. Zone Media’s hosting packages enable you to easily create a website or blog. You can deploy a range of applications such as WordPress, Joomla, Magento, osCommerce, Drupal, and SugarCRM with just a few clicks. They automatically update your scripts as well, so you won’t have to worry about using obsolete software. If you need a bit of help designing your website, Zone Media has their own website builder named Stream. This, however, isn’t included for free: you’ll have to pay extra on top of your web hosting package. Zone Media isn’t the most developer-friendly web host. It appears that they only support MySQL, PHP, and CGI scripts at this point, so you may not be able to code in more advanced scripting languages such as Ruby or Python while on their platform. Zone Media’s web hosting prices fall well within the market range; in fact, I found them pretty generous with the amount of storage and bandwidth they provide. Unfortunately, they charge VAT on all their products, and their range of pre-installed applications and value-added features isn’t the most impressive. You can either pay monthly or yearly, though you do get a discount if you go for an annual package. One thing to note is that there are no money back guarantees. Support-wise, they have a friendly technical team that’s available 24/7. You can easily reach them through phone, email, or support tickets. However, if you do get technical assistance from them, be prepared for a service fee that can amount to quite a bit, particularly if you contact them outside of regular office hours. This was a huge downside, considering most web hosts provide technical support for free. Zone Media is able to provide you stable hosting packages with a dedicated customer support team. Be aware that technical assistance may come with a hefty fee, unfortunately. 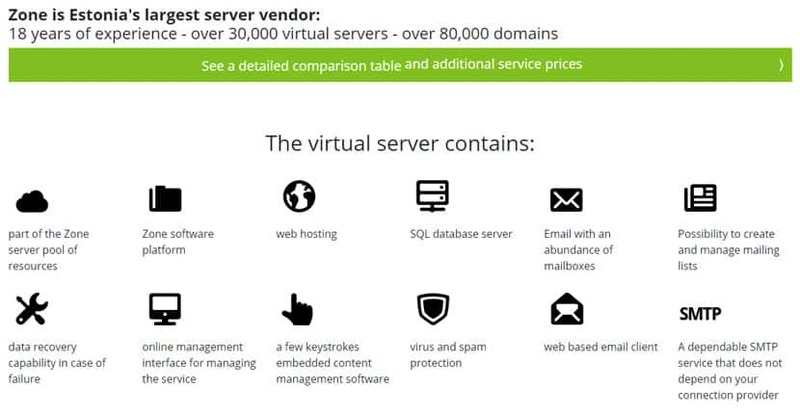 Wondering how Zone Media stacks up against other Web Hosting companies? Enter any other Web Hosting company and we will give you a side-by-side comparison.